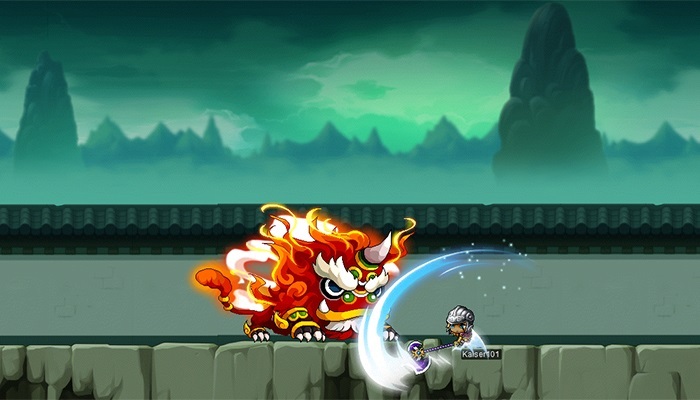 [updated] Lunar New Year Events: February 6 – February 20 | Dexless, Maplestory Guides and More! Celebrate 2018, the Year of the Dog, with fireworks and a new event dungeon! 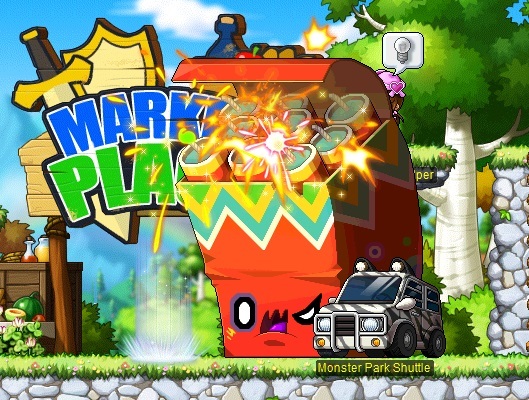 Maple World is decorated with lanterns and fireworks as part of the festivities. Start 2018 out with rewards! Players Lv. 33 and above can begin by clicking the Lunar New Year event notifier on the left side of the screen, and accepting the quest ‘[Lunar New Year 2018] Daily Hong Bao’. Talk to NPC Cassandra and you’ll receive a Daily Hong Bao that you can use to receive your choice of a special buff coupon (3x EXP or 3x Drop), and one random reward. The 3x buff coupons have a 1-day duration, and grant you 30 minutes of increased EXP or drops when used. 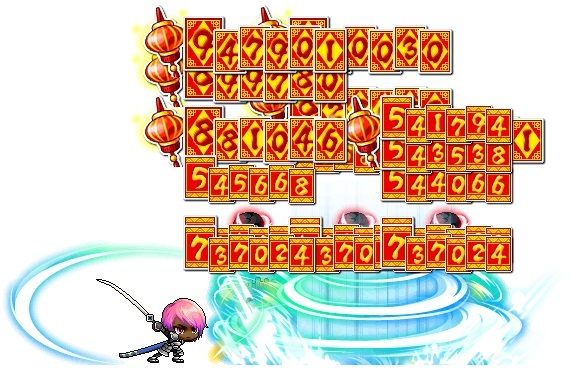 The random reward consists of Spell Traces, restorative items, trait items, Mysterious Meso Pouch, or Hong Bao Damage Skin Coupon. You can complete this quest once per day. Earn a special ring during Lunar New Year! Players Lv. 33 and above can begin by clicking the Lunar New Year event notifier on the left side of the screen, and accepting the quest ‘[Lunar New Year 2018] 8-Blessing Ring’. Hunt monsters within your level range (20 levels below and 20 levels above), and collect the No-Blessing Charms that they drop. These charms have lost their effectiveness, but you can speak to NPC Cassandra to exchange them for a reward! The first time you complete the quest, you’ll receive an 8-Blessing Ring and an 8-Blessing Charm you can use to enhance the ring’s stats. Return each day to hunt more monsters and you’ll receive an additional 8-Blessing Charm when you complete the quest. You can complete this quest once per day. On Reboot world, you’ll receive a Mysterious Meso Pouch instead of an 8-Blessing Charm. 8-Blessing Ring: Untradeable. STR/DEX/INT/LUK +2, Weapon ATT/Magic ATT +2. 8-Blessing Charm: Untradeable, 15-day duration. When applied to the 8-Blessing Ring, it grants an additional STR/DEX/INT/LUK +1, Weapon ATT/Magic ATT +1. [Updated February 8] Added duration to Fireworks Chair. Lunar New Year Firework Boxes are running loose in major towns! Keep an eye out while you’re in Henesys or Leafre, and you may spot one of these monsters. Defeat it to receive a special Fireworks Box. There are three different boxes, and they each contain a variety of random rewards. New Year's Buff: 7-day duration. Mysterious Meso Pouch: 7-day duration. Lunar New Year Fireworks Box Mask Coupon: 30-day duration. Use to receive a permanent Lunar New Year Fireworks Box Mask. The mask has limited-time stats for 15 days: STR/DEX/INT/LUK +6. Take part in a new event dungeon where you must face Nyen! Players Lv. 33 and above can begin by clicking the Lunar New Year event notifier on the left side of the screen, and accepting the quest ‘[Lunar New Year 2018] Nyen's Revenge’. This quest can be completed 4 times per day. Nyen has kidnapped each of the 12 animals of the zodiac. You’ll be sent to find Nyen's Hideout where you must fight your way through multiple stages and rescue the animals. 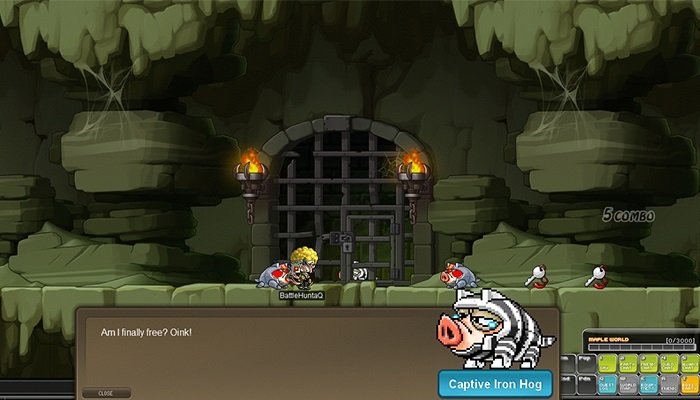 In order to save a zodiac animal, you need to hunt nearby monsters until they drop a key to one of cages. After saving 3 zodiac animals, you will face down Nyen himself! Daily Hong Bao: Untradeable, 7-day duration. 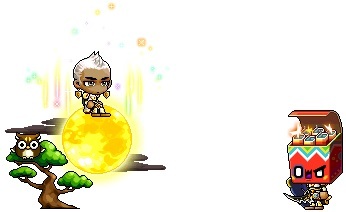 Nyen Damage Skin Coupon: Untradeable, 7-day duration. Nyen's Hat Coupon: Untradeable. Open to receive Nyen’s Hat. Daily Hong Bao: Untradeable, 30-day duration. Vengeful Nyen Damage Skin Coupon: Untradeable, 30-day duration. Zodiac Dog Damage Skin Coupon: Untradeable, 30-day duration. Red Orange Damage Skin Coupon: Untradeable, 30-day duration. Vengeful Nyen's Hat Coupon: Untradeable. Open to receive Vengeful Nyen’s Hat. Dancing Lion Mount: 15-day duration. 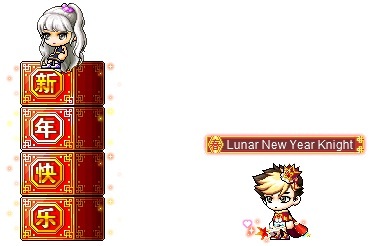 Continue to face down Vengeful Nyen multiple times, and you can receive special Lunar New Year Cube Chairs. Lunar New Year Knight: Title. Tradeable within account. STR/DEX/INT/LUK +8, MaxHP/MaxMP +888. If you save different types of zodiac animals multiple times, you will also receive additional Daily Hong Bao items, Spell Traces, and Power Elixirs. Sugar Coin Box: Untradeable. Can be opened anytime before 5:00 PM PST Feb. 11/ 8:00 PM EST Feb. 11/ 2:00 AM CET Feb. 12 / 12:00 PM AEDT Feb. 12. Earn various amount of Magpie Coins depending on the number of times you have opened this box. 1st Time: Magpie Coin (x10): Untradeable. 2nd Time: Magpie Coin (x15): Untradeable. 3rd Time: Magpie Coin (x20): Untradeable. 4th Time: Magpie Coin (x25): Untradeable. 5th Time: Magpie Coin (x30): Untradeable.